The miles seem to go by faster when you’re running with someone. So just think how much faster they will go when you join our outrageously good looking group of runners. Here’s the deal. It’s free. It’s for everyone. And it meets every Monday at 6:30pm at Federal Hill Fitness on 39 E. Cross Street. Turn off the computer and come join us for a run. We pass around a bag for your keys, phones, and anything else that jangles. We then put it behind the front desk at the Federal Hill Fitness so it’s all safe. We’ll mention any announcements, some key races coming up and the rules of the fitness center. Then everyone everyone introduces themselves (just their name and if they are new) and says their approximate pace (e.g 8 minute miles). If you don’t know, just say fast, medium, or slow. Use your outdoor voice. If you’re new, we pair you up with someone approximately your pace so they can show your the course. We follow a basic course that is about 4.7 miles. The faster folks add additional mileage and if you’re not quite feeling it, you can turn around sooner. We all end up back at Federal Hill Fitness around 7:15ish. There is always a water cooler and cups available. Then some people go out afterward for drinks/dinner. Doesn’t that sound a lot better than what you’re doing now? We’ll see you there. If you’re new, be sure to introduce yourself to the organizers (usually Ryan McGrath, James Dubose, or Susan Kim who will be standing next to the water cooler and key bag) and one of them will help match you up. Finally, if you know of anyone who likes to run, pass along this link. Or better yet, Like us on facebook, tweet about us, or be Old School and just bring them with you. I just moved to the city and tonight will be my first night with Federal Hill Runners. Thanks for putting this website up just in time! See you all tonight! I’ve been receiving your emails for a few years (embarrassing I’ve never joined a run!) After work has always been tough for me, and I think I’ve just been intimidated, however after this new site was posted, I’m officially committed. I’ll hopefully see you soon! We’re officially glad to have you. See you soon! So excited to see Federal Hill Runners going strong. Thanks to Ryan, Susan and many others who are leading the group! Great Job Susan on the website!! Look forward to running in the rain 2night! Good morning! I was planning on joining the group tonight for the first time. Will the rain cancel the run? I actually don’t mind running in the rain (aside from a downpour!) I am just wondering how I would know if it is cancelled or not. Any good running events coming up? On our resources page we have links to some good places to check for races. Are we still meeting for a 6:30 pm run on Memorial Day? Yes! Just heard from Ryan– he will be there! Coming out for my first run tomorrow. Woohoo! Looking forward to seeing you! Be sure to introduce yourself to me, Ryan, or James who will be standing around the water cooler outside. Hi, I am new to running and really haven’t run any solid distance such as those mentioned above. I think the most I’ve run is 2.5 miles. I was looking for people to run with since I’m usually by myself on the treadmill, but I was curious if I had to meet the 4.7 mile course as a minimum to join you guys? Darla- That’s great that you are starting to run. Here’s the good news about running with us (and running in general). You can turn back at any time! Around the 2.5 mile point we actually go by cross street– at Harborview. We continue running along the Harbor. What you could do is turn at Cross Street and go back to the start point. That being said– you may find out that you can run longer than you think as long as you start out slowly. My suggestions: Run with our slower runners and turn at cross street, if possible, bring a friend that runs at your speed/distance, continue to run on the treadmill especially during this cold weather. Be sure to introduce yourself to me, Ryan, and James (the leaders of the group) when you arrive. Welcome! Had a great time running with all of you 2 weeks ago! Looking forward to joining you again this week! Adam- While the club has some very fast runners, it also has some that are not so fast (10 min mile pace). And remember, you don’t have to run the whole course. Just moved to the area and am looking forward to joining you all this coming Monday! How rookie are you? If you’re more a walk-jogger, we recommend that you come with a friend at about that pace. Once you move up to 9 minute miles, you’ll have lots of company. Rookie to the point that I don’t even know what my pace. I think bringing a friend is a great idea. Looking forward to catching up with you 9 minuters! Going to bring my daughter tonight for our first meet so that way i won’t be running alone. Great! See you tonight. Be sure to introduce yourselves to the organizers (me– susan kim, ryan mcgrath, and jame dubose) before hand. Ryan, you’ll be a great fit. As for the distance, that varies. We all run approximately the same route but the faster runners add some extra distance so we all finish at about the same time. We do one main route in the summer (avoiding the inner harbor– too crowded) and then do the harbor route the rest of the year. Danielle- Yes, we only meet on Mondays. There are other groups in the city though that meet other days. Charm City Run in McHenry Row does wednesday runs and has a marathon training group. this looks/sounds perfect. see you guys tomorrow I hope? Good run tonight! Glad I could join you guys. Thanks for the hospitality for this out-of-towner. Is this group still active? Are runs still starting at 6:30 pm? coming out for my first run tonight! I am very excited to meet the group. do you have people running at an 8:30/9 min mile pace? Hey guys- I haven’t been able to make it out on Mondays in a few weeks, but I do recall there being mention of a long run in Patterson Park this Saturday (9/21). I was wondering if someone could pass along a bit more info (start time, meetup location, specified routes/distances)? Thanks! Are you guys still doing this? I would love to join you one evening. If you’re looking for more community and workouts there is a group working out on Federal Hill every Wednesday morning, 6:30 AM. We meet by the cannon and workout hard for about an hour, then we all go to work. It’s pretty crazy, lots of sweaty bear hugs, cussing, yelling and high fiving. Just thought some people might be interested. Check out the facebook page. We’re not just a running club however so some members were asking about running clubs; I thought I might inquire as to whether or not you guys were still running on Monday evenings. Is anyone running tomorrow? Just wondering since it’s still the holiday season. Hi, I am an Oregonian runner and am visiting Baltimore for a few days this week and was wondering if there was a group to run with in the mornings near the Harbor/Convention Center. Such a thing exist? Hoping to brave cold temps and see some of the city vs. run the hotel treadmill the whole time. Any info is appreciated. are you guys meeting today? I love running, but I hate running alone and this is a great way to kill 2 birds with 1 stone. Thank you for putting up the site and I will be out for my first run tonight. Asking for some help: I have just moved to Rosedale and am looking for a running store in this area. Any suggestions are appreciated. I wanted to know how I can join. I’M going to try to make it to this run on Monday. Ruining without my phone will be a new/scary experience. Do you still have your Monday evening runs? The last post was a year ago, so I’m just making sure. Is there an e-mail contact? 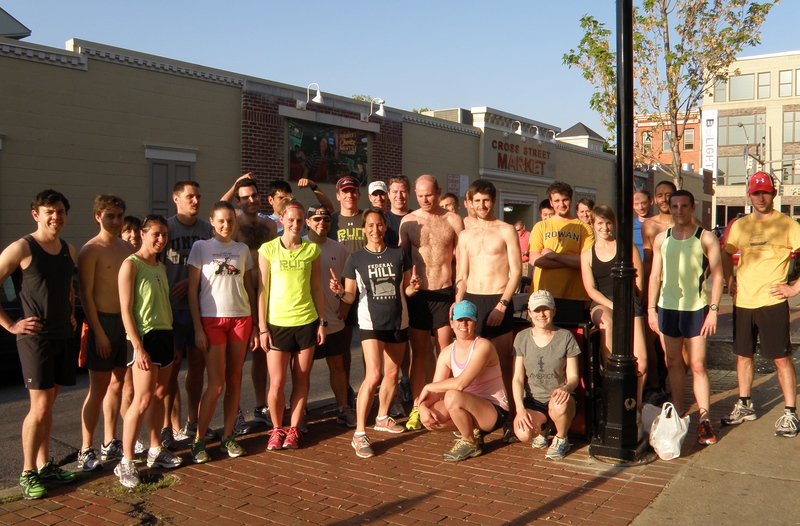 Is there a “floor” to the pace that can run with the Fed Hill runners? Say, for slow-slow-slow-slow runners – 12 minute miles on a treadmill, maybe 12:30 – 13 minutes on pavement? I just moved to this area two weeks ago. I would love to join you ASAP. Is this schedule on for the coming Monday ( labor Day) ? I would like to be added to the Monday newsletter. THIS IS THE BEST RUNNING CLUB EVER!!! But seriously. I see that the las comment here is from 2013. Are you all still active? And if so, are you still running this time of year? Do you still have the classes and is there one today.I would love to join. hello is this still being done? I will be in town for a conference in a couple of weeks and would love to join in on this run. Do you allow out of towers to participate? I will be there this Monday,as well where is the Fed hill fitness center and what time. Hey I just moved into town and I actually don’t run that much, but I do love doing claisthenics/street workout. Do you guys know anywhere near the Federal Hill area where I can do this sort of working out? I’m thinking more of a public open space. Hey Sean – apologies for the months-too-late response. I trust by now that you’ve probably found a couple of places, but if you’re still looking for a place, there’s some great open spaces at Fed Hill Park, Riverside Park, and down by Under Armour headquarters in Locust Point! Hi new to the area and I am a competitive marathon runner/Boston qualifier and looking for a running group but can only run in AM because of work. Does your running group have AM runs during the week? Hi Deb – my apologies for the months-late response. If you’re still in the area and looking for morning run groups, shoot me a message at runbaltimore at gmail dot com and I’ll point you in the right direction. Will you guys be doing a run tonight? Hey Ali – it’s RM. Nearly a year later I’m getting around to checking out comments on the site. Ha! I am a highschool senior and my colleague showed me this site because I told her I wanted to join a running club so I can get better at running. I read this clubs info and I would like to join the team? Where do I sign up? And is there a entry fee ? Hey Anthony – sorry for the very, very delayed response. If you’re still around, all you have to do is show up on Mondays, ready to run at 6:30pm. No sign up, no entry fee. We run between 4 and 6 miles and the paces vary from under 7 minutes per mile to about 10. I’ve been wanting to find a group like this! Do you need to be a member of Federal Hill Fitness to join? If not, is it still 6:30 every Monday throughout the winter months as well? Hi Jamie – obviously a little late in response, but we meet every Monday throughout the entire year, regardless of weather, at 6:30pm. And while we encourage everyone in the area to join the gym, it’s not a requirement to run with the group! Hi Marcia – yes, we still meet. We don’t often check the site because we’ve never missed a Monday in over 13 years! Are you folks still doing the run Monday nights? Hi Brian – yes, we still meet every Monday at 39 E. Cross St (Fed Hill Fitness) at 6:30pm!